Today was much more spring like and sunny, whoo hoo! I am one more day closer to spring break and it actually felt like spring! Please note the pile of laundry in the corner of my bedroom is much smaller, it is only my husband’s clothes! One question I have been asked about my OOTD posts many times is – How often do you go shopping? I don’t go shopping very often. I tend to go on three or four shopping sprees a year, usually at the end of a season, where I stock up on the last season’s clearance items. When I do buy clothing, shoes, or accessories I will let you know in my posts that they are new purchases. Several people were under the impression that I have been buying recently all of the clothes in my posts because I have been giving the price of each item. I post how much everything costs because I don’t want you, my readers, to think you need to spend a lot on clothes. Hope this clears up any misconceptions or questions. Please know I am on the journey of being and becoming frugal. I used to think fabulous = expensive, I am learning this is not always the case. Coral striped top with silver sequins detail: $8.09 Banana Republic Outlet. I love coral, stripes, and sequins – this top is a match made in heaven for me! 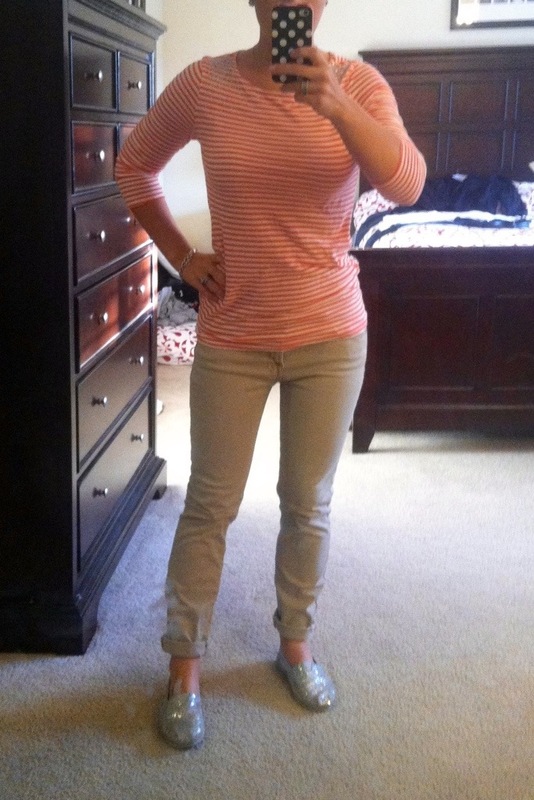 It sings, “spring is here!” 7 For All Mankind Skinny Crop & Roll in khaki: $70 Nordstrom Rack, bought last year. I am a short girl (5’2), check out this link to see how they would fit someone taller. I forgot I had these pants and found them in my closet this morning. One of the perks of being a clothes hoarder and not very organized is “shopping in your closet” and finding things you forgot you had! 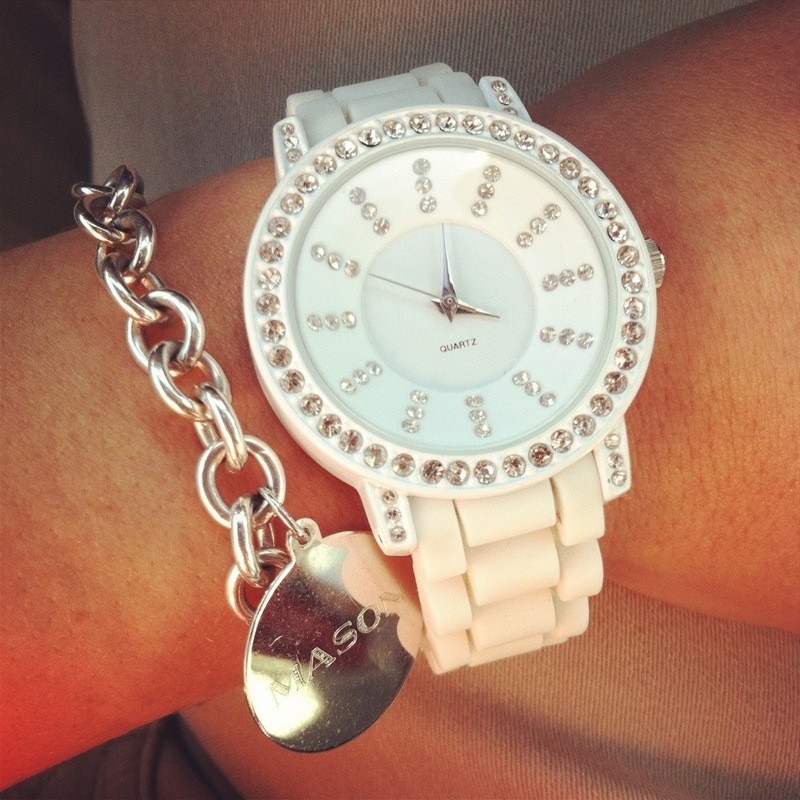 White rhinestone and rubber watch $9 Target, bought in November 2012. I love this watch and the price was fantastic! I get a lot of compliments on this watch and people are shocked that it was only $9. Sterling silver Tiffany style bracelet with personalized charm: gift from mother-in-law. I love this bracelet! My son’s name is hand engraved on one side “Mason” and his birthday is engraved on the back. In my husband’s family all of the women have “mom” or “grandma” bracelets like this with a tag for each child in the family. Hopefully sooner, rather than later, there will be another little tag on my bracelet. I agree! 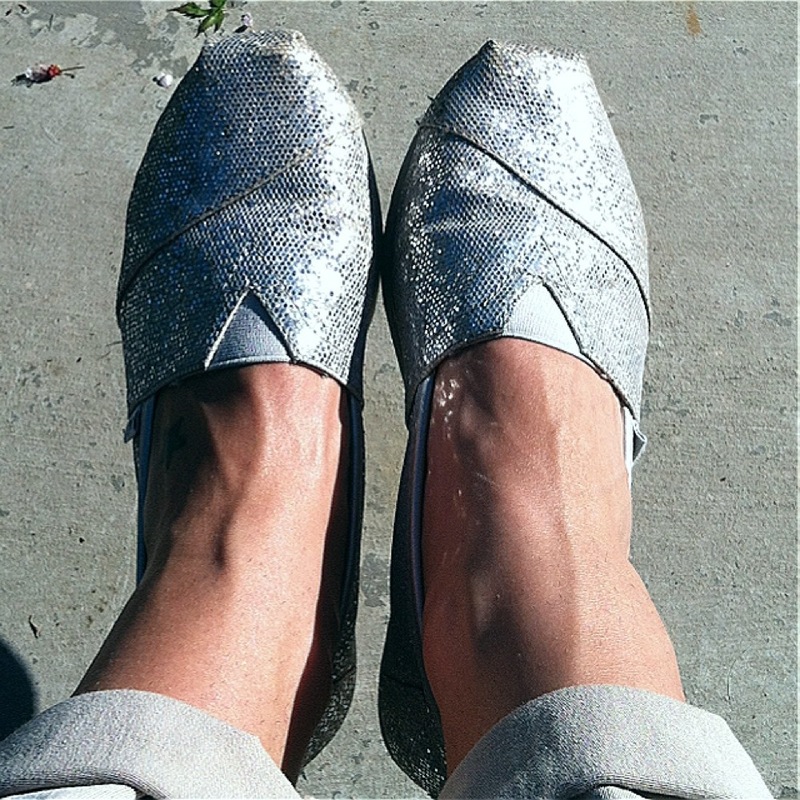 Toms are awesome! I don’t know if I can do those toe shoes, but I do love yogi-toes!